Professional growth and sharing is a big part of our culture at Viget — with each other and the larger web community. And whether it’s blogging, joining a panel at a local event, or planning a meetup with industry peers, we know the value of building a network within your professional community. So when The Chronicle of Higher Education approached us about building Vitae, a product to help members of the higher education community grow their careers, we were excited to dive right in. Founded in the 1960s, The Chronicle has been the top name for news, advice, and jobs in academia for decades. When they took their publication online in 1993, they were one of the first newspapers to make the leap to the Internet. So it’s no surprise that The Chronicle was first in line to innovate again — this time to solve the unique and long-standing career challenges academic professionals face. In recent years, members of other industries, especially our own web/tech industry, have come to count on various social networking sites to help find jobs, connect with other professionals, showcase achievements, and build careers. But what we consider “the usual channels”—LinkedIn, Facebook, Twitter, and others—just don’t have the flexibility and features to show academics at their best in an online, professional environment. So we set out to create an online career hub to meet the unique needs of this community. For the past year, we've embodied all-things-academia to understand higher education career paths and the complex academic hiring cycle. An application built in Ruby on Rails, we designed and developed a robust platform that focuses on functionality key to this audience. An academic career can span the course of a lifetime and, until now, there hasn't been a digital platform to showcase a full body of work. Vitae's profile system is flexible enough to fit the diverse members of the higher education community. 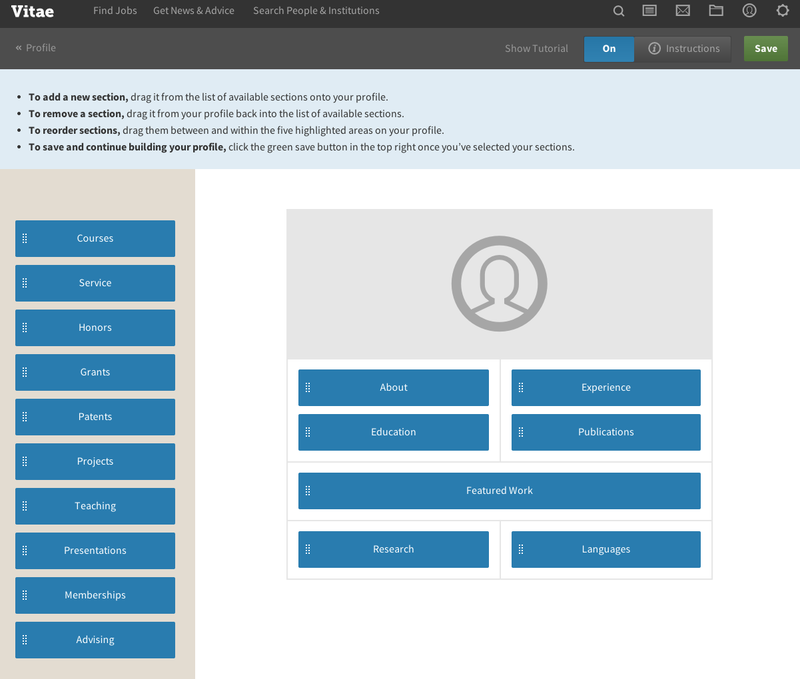 Whether a first-year graduate student, a college dean, or a university professor, users can tailor their profiles to meet their needs. 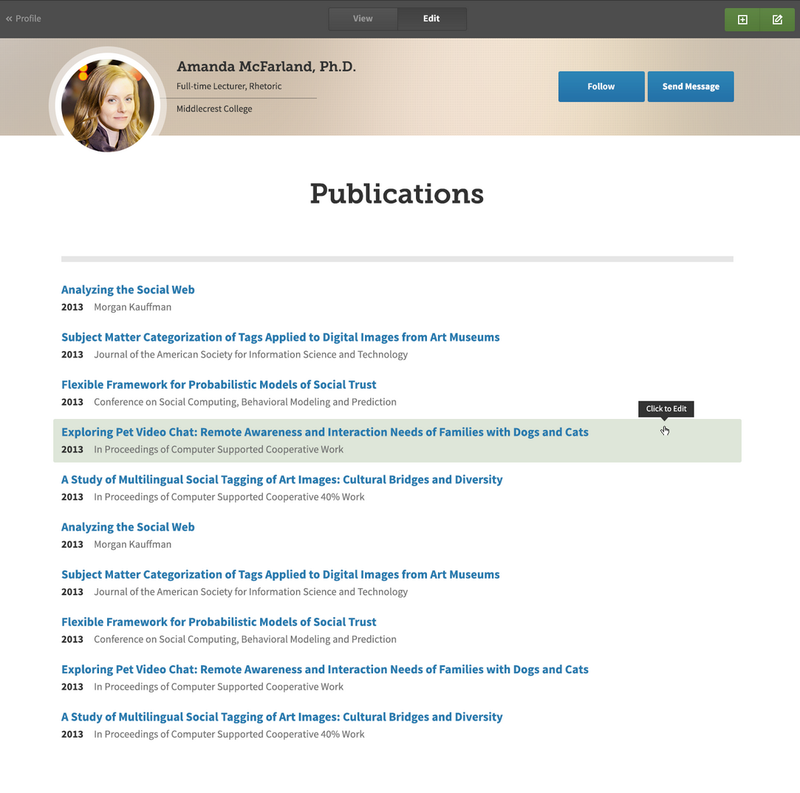 A research-focused faculty member may prefer profile sections like 'Publications' and 'Research', while a teaching-focused professor may choose 'Courses' and 'Teaching' to feature on their profile. We knew this community was busy, and wanted to avoid "another profile" that was time consuming to populate and maintain. 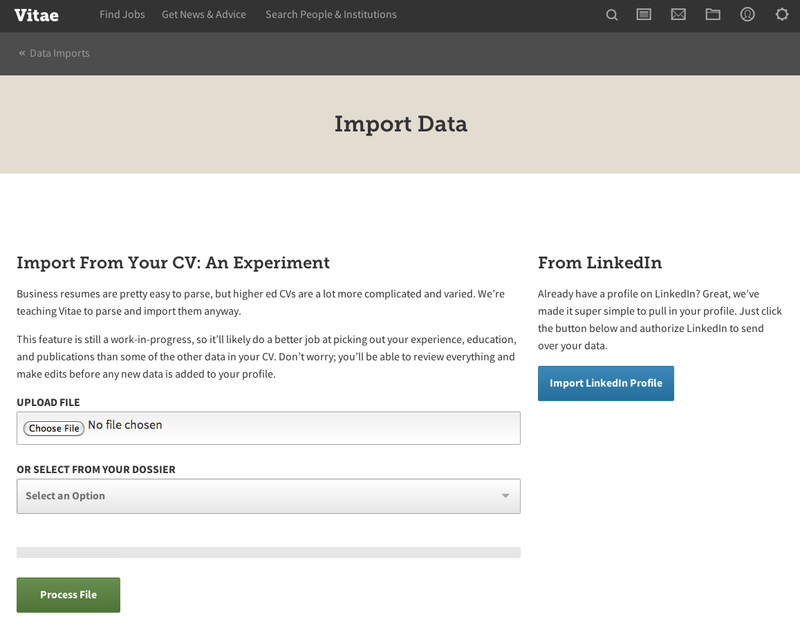 If users don't want to fill out a profile by hand, they can import data from LinkedIn or their CV. And entering large volumes of new data—like long lists of publications—is seamless. 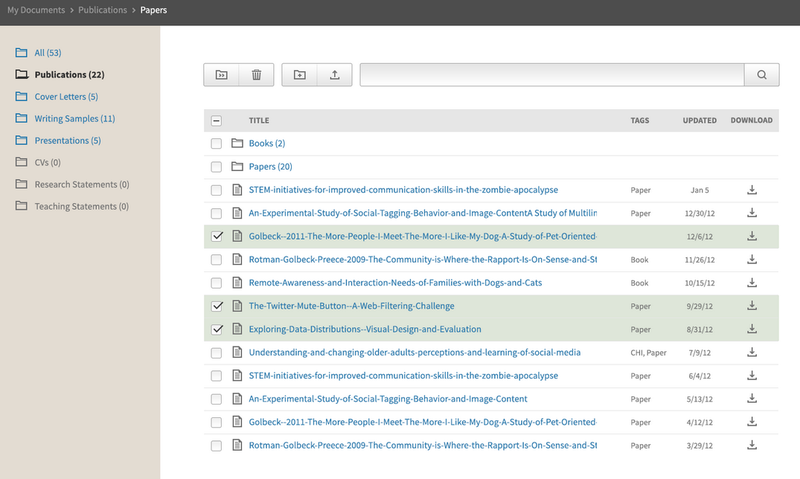 Vitae is not just another quasi-social, quasi-professional online network. Vitae uniquely reflects the networking culture that’s already in place throughout academia. It prompts users to identify that they know each other and how, which makes for more discriminating choices than are typical of other online networks. In addition to connecting with colleagues, members can access and share the latest news about academic careers written by The Chronicle's editorial team and thought-leaders in higher ed, known as Vitae Voices. When members enter the (ever more competitive) academic job market, they can search thousands of jobs by multiple metrics, save them for later, and get notified when there are new jobs that match their interests. There's also an easy way to manage the hundreds of documents that make up an academic dossier, keeping them handy for job applications. And when they find the job they're looking for, they can manage the entire application and submission process — all within in Vitae. This is just a glimpse into the opportunities that came from working with The Chronicle on an innovative product. We’re excited to see Vitae help academics get ahead in their careers, and become a staple part of their culture. For more details, check out our full Case Story here. Today, we’re thrilled to share the results of all our work and present chroniclevitae.com.